The Swix F4 wax has been a staple in our ski packs for years, waxing fishscale bases, smooth base skis that are sticking, and climbing skins with snow buildup. I also use F4 at times on the top of the skis and in the bindings to reduce snow sticking and buildup. Snow gets very sticky/clumpy when it goes from cold to warm, right around freezing. This is good snowman snow…. but it is sticky on ski bases and skin material. This can happen with new snow that is warming due to the temperature rising to at or above freezing and it is also found (especially) in the spring when cold new snow gets warmed by spring sun or one skis from a north facing aspect (cold) to an south facing aspect (warm). Basically you have sharp and pointy cold snow crystals that – when they first warm – are very sticky until the round out a bit. After a day or two of warming they will no longer be a problem. The F4 works well in the field as it can be put on both base and skin material, allowed to dry for a few minutes and you are good to go. 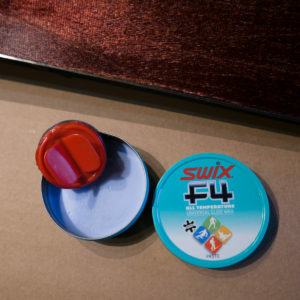 This is the round tin of Swix F4 that is nice to carry, fitting easily into a pocket. It is a thicker paste then the more liquid versions in the bottles so takes less per application. The container is 40ml. This wax needs very little to be effective, just enough to darken the ptex or skin. When applying to the skin part of the base (that would be the “fur”)apply it with the nap or diagonally. Do not rub or apply the wax against the direction of the fur (tail to tip). We find the standard F4 paste to be more effective and longer lasting then the specific skin wax that Swix now makes so we recommend this over the Skin specific F4. 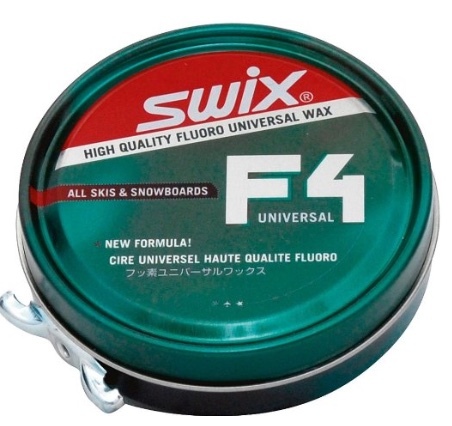 Be the first to review “Swix F4 Easy Glide Wax – Tin” Click here to cancel reply.